The purpose of growing transplants from seed is to provide them with the correct environment for the important early growth period. This requires both care and common sense on your part. Cleanliness, temperature, moisture, and light all contribute to the healthy development of your plants. The following are supplies — or conditions — you'll need in order to grow transplants at home. Planting medium. Young seedlings are subject to damping-off — a disease that can ruin your potential crop in infancy. Avoid disease problems by using a sterilized planting medium. Regular potting soil is too rich and will encourage the young plants to grow too quickly. Instead, buy a seed-starter medium from a reputable garden center. Flats. These are low-sided plastic trays or containers used for planting seeds and are often subdivided into divisions for each half dozen or so plants. 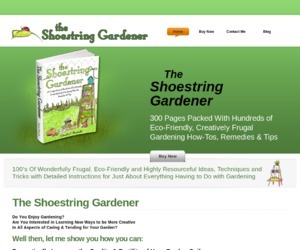 They're designed for use by nurseries and professional gardeners, and are usually sold wholesale. Make your own flats out of any shallow container that has sides a couple of inches high; an old cake pan is fine. Whatever container you use, be sure to punch a hole for drainage in the bottom. Plantable containers. Some varieties of vegetables do not transplant well. They resent having their root systems disturbed and punish you by failing to thrive after transplanting. Among these varieties are corn, okra, beans, cucumbers, squashes, and watermelons. If you start these varieties Indoors you must use containers that can be planted along with the seedling. There are several kinds. Peat pots are simply compressed peat shaped into a plant pot, and they come in a number of shapes and sizes, so you can match them to the type of seedling you're growing, jiffy pellets are also made of compressed peat, but you buy them as little flat discs a couple of inches across. When you add water they rise to two or three Inches In height. Jiffy 7 pellets have a net wrapping holding the peat in place. This wrapping is supposed to disintegrate within a year after being planted out in the garden; in fact, the wrapping doesn't always disintegrate that fast. Jiffy 9 pellets do not have the wrapping. They disintegrate faster in the soil, but crumble more easily with handling. You can buy trays to hold a dozen or more Jiffy pellets, or you can stand them side by side in a flat. seedlings out of the seedbed. Lift them from underneath with a knife, spatula, or stick, and hold them by their leaves to avoid permanent damage to the stems. 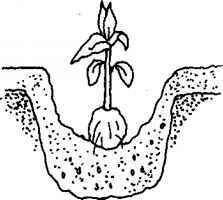 Make a hole in the new planting medium deep enough to accept the roots without crowding, and set the seedling's roots into the hole. Press the soil gently around the roots. Water newly planted seedlings carefully to get rid of air pockets and to ensure that the roots will not dry out; then label them. At this state of their development young seedlings have very definite requirements. They need temperatures that are a little on the cool side. For most vegetables a nighttime low of 55°F and a daytime high of 70°F is about right—if it's cooler, disease problems may show up; if it's warmer, the plants will get tall and spindly. It's also important that the seedlings get plenty of light—at least six hours of bright light a day. If your indoor space can't provide enough natural light for your vegetable seedlings, use artificial light as recommended earlier. The best kind are plant growth lights; they emit high levels of blue light, which encourages good stocky vegetative growth. The lights should be close to the leaves of the plants—about six to eight inches is ideal. Keep the lights on for about 12 hours a day; an automatic timer is handy if you're not going to be around. Clearly you cannot take these pampered young seedlings straight from their protected indoor setting into the cold, cruel garden. They'd literally die of shock. You have to prepare them for the change in environment, a process known in horticultural terms as hardening-off. You can do this by taking the plants outside during the day and bringing them back in at night for at least two weeks—keep them in, though, if there's likely to be a frost. You can also put them outside in a protected place—a cold frame or a large box—and cover them with a rug or blanket at night. This treatment will ready them for their final place in the vegetable garden. A lot of people find that buying transplants from a reputable nursery or garden center is the easiest way to start their vegetable garden, providing high-quality transplants and few problems. Growing your own transplants from seed is a challenge to your growing skills; it requires a lot of time and planning. and it can be messy. It's more expensive to buy transplants than to grow your own, and you have fewer varieties to choose from. But buying transplants is a lot less work, and if you buy wisely you can get high-quality plants. Choose the vegetables you buy as transplants on the same principles that you'd use if you were going to grow your own from seed at home; base your decision on the length of your growing season and the flexibility of the plant variety. Plants that adjust without much difficulty to transplanting are broccoli, Brussels sprouts, cabbage, cauliflower, chard, lettuce, and tomatoes. Celery, eggplant, onions, and peppers are slightly less tolerant and require more careful handling. Plants that do not transplant easily are beans, corn, cucumbers, okra, peas, summer and winter squash, and watermelons. Don't buy these vegetables as transplants unless your growing season is too short to let you grow from seed. If you do buy them as transplants, make sure they're in individual containers that can be planted with them. Always buy your transplants from a reputable source—a good nursery or garden center, or through the mail from an established supplier. The supermarket is not the place to look for vegetable plants. If you buy from an established source you know that the plants have been grown with care, and you know who to go to with questions or problems. If you're buying from a mail order seed company, the company will usually ship your plants at the right time for planting. If you're buying from a garden center or nursery, buy the transplants just before you plan to set them in the garden, and take time to choose healthy young plants that are free of pests or diseases. Before you go to the nursery or garden center, make a written list of disease-resistant varieties, and stick to it. Check plants carefully before you buy, remembering that they're fragile and not made for manhandling. Check stems and leaves for any signs of pest or disease problems. Just before you buy them, slip a seedling out of its container to make sure that the roots are white and healthy. And , don't forget to find out if they've already been hardened-off. If you buy your transplants and find you can't put them into your garden right away, leave them outside in a sunny area. If they're tender varieties, bring them inside at night before the temperature drops. Remember, too, that your transplants are in very small containers and will use up the available supply of moisture quickly. Check them often and water them as necessary. Set supports for pole beans at the time of planting. When you move your own transplants or bought plants into the vegetable garden depends on the variety and your average date of last frost. Refer to the chart at the end of this chapter to find out when you can transplant each type of vegetable. Arrange them on the prepared soil bed so that you can judge the correct spacing. The spacing chart at the end of this chapter gives you detailed information on how much space each variety needs. 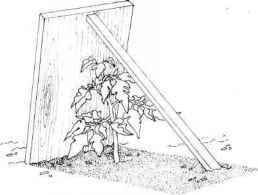 If the vegetable will need a support later — stakes for tomatoes, for instance, or trellises for beans — set the support at the time of planting. 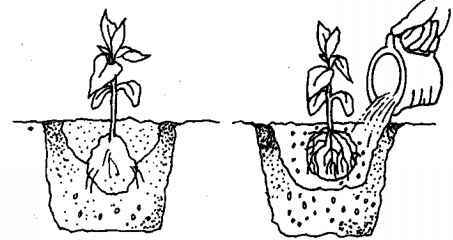 If you wait to stake or set up a support you risk damaging the plant's developing root system. Break off the lip of a peat pot before transplanting. permanent damage to the young plant. If you have to handle the plant, hold it by the leaves, not the stem. Set each transplant in the soil, and tamp the soil around it firmly with your hands. Don't plant transplants too deep; set them at the same depth they were in the container. 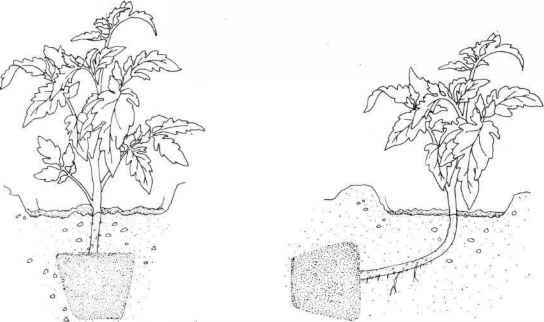 If they are tall and leggy, make a small trench and set the plant at an angle so that some of the stem is also under the soil and the remainder stands straight — the illustration on the next page shows how. 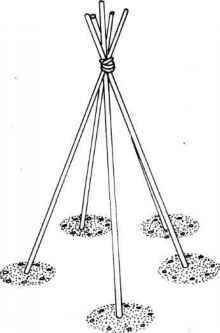 This will mean that only as much stem as the plant can support comfortably is left above the ground so that the plant won't get top heavy as it develops. 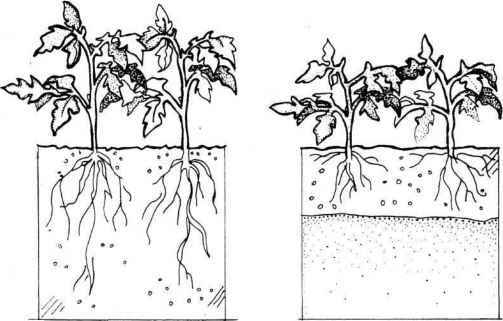 Long-stemmed tomato seedlings can be planted deeper or on a slant so that they won't grow top heavy. information on how to protect the plants from unforeseen threats like extreme temperatures, pests, and the like. Whether vegetables are grown from seed or transplants, they require the same care once they're in the garden. Follow the protective procedures indicated to keep your plants healthy until harvesttime. 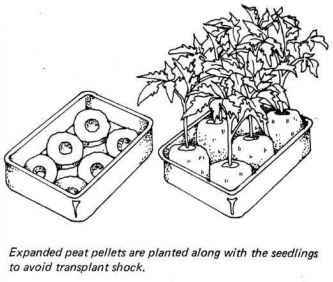 Transplanting your seedlings: Set the seedling in a hole large enough to accept the roots without crowding; fill in and firm the soil; and water with a starter fertilizer solution. susceptible to weather conditions than transplants grown indoors. The vegetables to grow from seed are those that will mature within the span of your growing season and those that don't like to be transplanted. If your growing season will accommodate them, all these vegetables do well grown from seed in your garden: beans, beets, carrots, collards, corn, cucumbers, dandelions, kale, kohlrabi, lettuce, mustard, okra, peas, peanuts, pumpkins, rutabagas, soybeans, spinach, squash, turnips, and watermelons. Soil preparation is the key to successful planting. The first step is to dig up and turn over the soil to a depth of eight to 12 inches—hard work, but a good way to spend a crisp, early spring day. It's important that the soil is neither too wet nor too dry when you dig. Soil that's too wet will compact or form into large clumps that will be so hard when they dry out that nothing short of a sledgehammer will break them. If the soil is too dry, the topsoil will just blow away. Before you get into a good day's digging, pick up a handful of soil and squeeze it; if it forms into a ball that will hold together, yet crumbles easily, the soil is ready to work. Adding organic matter. Organic matter enriches the soil and improves its ability to control moisture, so add organic matter in the spring to benefit the new season's crop. If you planted a green manure or cover crop in the fall to protect the topsoil, dig it all back into the soil now as organic matter. Do the same if you laid mulch over the soil instead of planting a cover crop; dig the mulch in as you turn the soil. You can also dig in compost that has been simmering nicely all winter. Fertilizing. You should fertilize your vegetable garden twice a year. As part of your spring soil preparation, dig in a complete, well-balanced fertilizer (10-10-10 or a similar formulation) at the rate of one pound per 100 square feet or 10 pounds per 1,000 square feet. Work the fertilizerAvenly into the soil. This application will keep your plants supplied with nutrients until about halfway through the growing season. Then you'll apply the same fertilizer at the same rate, but instead of spreading it over the whole area you'll side-dress by distributing the fertilizer in trenches between the rows of plants. Removing obstacles. When you're preparing the soil, remove all stones, rocks, and lumps, and all the assorted debris that has accumulated over the winter. This is especially important if you're planting root crops, because they'll fork and split if they have to contend with large obstacles; but all seeds do better in well-worked soil. Just before planting, rake the seedbeds smooth and level off the surface by drawing the back of your rake across the soil. Sowing seeds sounds like a straightforward procedure; but like most of your other gardening activities, there's a procedure to follow to ensure success. One of the easiest mistakes to make is to plant the seeds too deep—or to assume that all seeds are planted at the same depth. How deep you plant seeds depends on their size; they need only enough soil to cover them and supply moisture for germination, and seeds that are buried too deep may not be able to struggle through the soil surface. The planting guide at the end of this chapter tells you exactly how deep to plant seeds of each vegetable variety. The rule of thumb is that seeds should be covered up to twice their diameter at their largest point. That means if a seed is half an inch in diameter, plant it an inch deep; if the seeds are so small you can hardly see them, just press them into the surface of the soil. After you've set seeds at the correct depth, firm the soil by tamping it with your hands or (gently) with your foot. This prevents the soil from drying out too fast; it also helps keep rain from washing away both the soil and the seeds. Water generously; deep watering encourages healthy root growth in young plants. vining crops like cucumbers, melons, squash, and watermelons. Keep an eye out for these pests and hand-pick or wash them off the plants quickly, or spray the plants with carbaryl before they can spread disease. Detailed information on pest control and disease prevention is given in "Keeping Your Garden Healthy." Don't let your seedlings die of thirst. Adequate watering is essential to young plants in their early stages of growth. Be careful when you water your seedlings, because a forceful blast of water can damage them permanently or even wash them right out of the ground, but be generous. Water to a depth of six to eight inches to encourage deep rooting and stronger growth. If your area is likely to have heavy rains when you're waiting for the seeds to germinate, apply a very light mulch over the seedbed — this will also help to retain the moisture that's in the soil. Don't overdo the mulch or put it on so thickly that the germinating seeds can't push through it. Give plants room to grow. Thinning is another essential task in the early stages of the seedlings' development. Refer to the planting guide at the end of this chapter for specific instructions on spacing each variety. Thin when the plants are young — when they have formed two true leaves. If you wait too long they may already have suffered from being overcrowded. Thinning is a job that a lot of gardeners do with some reluctance. It seems wasteful to throw out all the extra little seedlings, but if you don't do it you're condemning all your plants to overcrowding and a miserable existence fighting for food, light, and water. You're also defeating your own purpose, because overcrowded plants will give you a poor crop. Start saving money now with Vegetable Gardening 101. 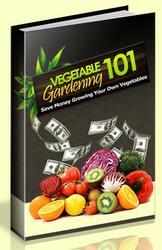 Save Money Growing Your Own Vegetables. Are you looking for a way to supplement your food budget? Are you tired of the increasing prices at the grocery stores, especially when it comes to healthy products such as fruits and vegetables? Do bell peppers have to be dry before they become plantable? How to mark jiffy pellets matchsticks? How to make a garden from pellets? How deep are vegetable roots roots?